Apple’s iPhone 5C is the company’s first smartphone model that comes in various colors. In terms of hardware specs it is similar to that of the previously released iPhone 5. Because it is similar, most of the common problems of the iPhone 5 are also inherited by the iPhone 5C. In this article we will be discussing some of the most common problems you will be facing with the 5C. If you have a particular problem that you have with your device and need help with it feel free to email us at [email protected]. We will find a solution to the issue you are facing and we will feature it in our future posts. When sending us an email try to provide as much detail as possible so that we may get to the root of the problem easily. While listening to music or surfing the web you may notice that your battery life will drop significantly. Most users say that they have experienced at least a 10% drop in battery life for 30 minutes of moderate usage. We all know that smartphones consume a lot of battery life however if your particular model drains quite fast here are some of the steps you can take. First you need to test the battery drain of your device. Go to Settings > General > Usage and check out your times. The usage time is the actual time you have used the device while the standby time is the total time since your device was last plugged to a charger. What you need to note is that the usage time should be lower than the standby time. If your usage time is equal to the standby time then there is a problem with your device. To test the battery drain place your device to sleep for 5 minutes. When you wake up the device take note of the standby time which should increase by 5 minutes. The usage time should increase by less than 1 minute. If it increases by more than minute then there is a drain issue which keeps your device from sleeping. Some causes of battery drain can be resolved by taking the following steps. You may notice that your iPhone 5C will suddenly black with the Apple logo then return to normal. This case usually occurs when playing games. To fix this issue you need to update your device with the latest software version. Plug in your device to a power source. Tap Download and Install to download the update. Updates might download automatically while your device is connected to Wi-Fi and a power source. Tap Install when the download completes, or tap Later to install the update later. If your device is passcode enabled, it will ask you to enter the passcode before installing the update. When using a particular app you may notice that your device will suddenly freeze. The first thing to do during this scenario is to do a soft reset on your device. This will refresh your phone memory and make it work normally again. From the home screen, press and hold the Power key and Home key. Release the keys when the Apple logo appears. Your Apple iPhone 5c restarts. Once your device has restarted check and see if it has sufficient memory. If only a little amount of memory is left you might want to uninstall some of the apps which you don’t regularly use. Finally, make sure that your device is running on the latest software version. When connecting to a Wi-Fi network you may experience constant disconnections. This may be a problem with the wireless router or the phone. To check if it is a phone issue try connecting to another Wi-Fi network and see if you are getting the same problem. If the issue remains then it’s most likely a problem within the phone. Tap Settings > Wi-Fi and turn Wi-Fi off and on. If your Wi-Fi setting is dimmed, restart your device and make sure Airplane Mode is turned off. Confirm that your Wi-Fi router and cable or DSL modem are connected to power, turned on, and connected to the Internet. A quick temporary fix for an iPhone 5C with a broken Home button is to activate the onscreen home button. Just go to Settings>General>Accessibility>Assistive Touch> On. The more permanent fix is to have the Home button repaired. If your device is still under warranty you can bring it to the Apple Store. 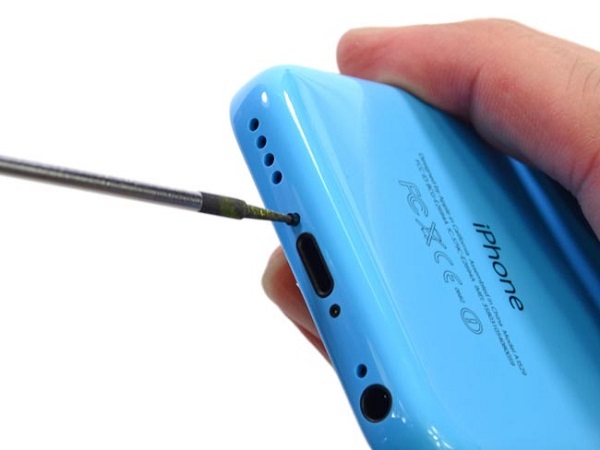 There are various reasons why an iPhone 5C won’t turn on unless plugged into a charger. One of the first things to check is the battery. If the battery is weak or faulty then it is possible that it cannot carry enough charge to turn on the device. The following troubleshooting steps are suggested by Apple in cases like this. Verify that the Sleep/Wake button functions properly. If it does not then you need to have this checked at an authorized service center. After 30 minutes of charging if the device turns on normally then update its software. If the device does not turn on after charging then try to press and hold both the Sleep/Wake and Home buttons for at least 10 seconds, until you see the Apple logo. If nothing happens then connect your device to a laptop with the latest iTunes software installed and if it gets recognized then attempt to restore the iPhone.